If you're alive, you're trying to get better at something. It could be your golf swing or guitar, parenting or painting, gaming, cooking, or any other skill. The strategies in this book are top-shelf, pulled from neuroscience, research on excellence, and world-class masters in many fields, presented in an easy-to-understand style that is sometimes funny and always friendly. Hundreds of helpful images and graphics. 1-Talent Is Practice in Disguise: Learn the three kinds of practice, and how your brain is rewired when you learn new skills. 2-Motivation Is Like Bathing (A Daily Requirement): Your deepest, unspoken beliefs profoundly affect your motivation to improve, ya filthy animal. 3-You Are Unique (And So Is Everybody Else): Learn why your reaction to difficulty matters. And why teachers and coaches matter just as much. 4-Time: The Most Valuable Thing You Spend: Forget the 10,000-hour rule. Practice time isn’t what you’ve been led to believe, nor is it otherwise. 5-Where You At? Where you practice and who you’re with will affect how fast and how much you improve. What can you do about it? 6-Do it To it! Some of the most effective practice strategies and techniques: used by pros, tested by science! Este libro es bien ameno, se escucha con facilidad. Está lleno de excelentes ejemplos que dan la confianza de que los hallazgos del autor están bien fundamentados en investigación. es además súper motivante. The price was a steal but in the back of my head I thought it would overlap with Dan Coyle's work. I was pleasently surprised! 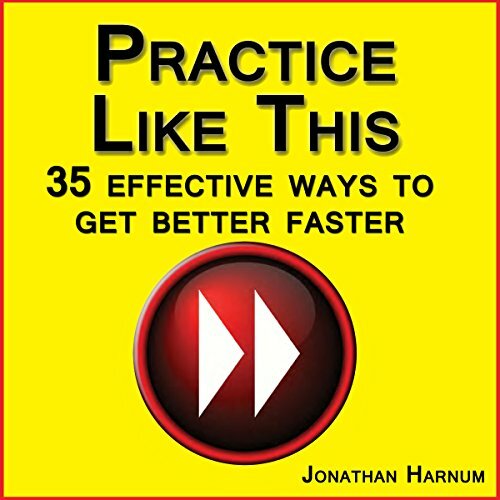 There are many great concepts in this book like chaining and performance speed chunking that I am excited to use. It contains unique information different from Dan Coyle, Josh Kauffman, and Tim Ferriss. Short enough to go through a few times to really absorb, and well read by the author. Highly recommended! Will definitely purchase the e book or hard copy so that I can highlight and journal the practices that I implemented and the results that I achieved. Can’t wait! Great delivery, quick, and well thought out! I will listen multiple times to absorb the material! lots of good learning tools. Love the numerous links and resources he provides to lead to more learning. Jonathan Harnum is very skilled at explain in the simplest terms how the body learns and retains. I have read countless books on the subject. This is one of the most comprehensive and entertaining of the bunch. The book also offers a great deal of resources to the listener for further study. Well done. Clear, concise facts on how to practice for optimal retention. I have read a lot on the subject but this book gave new information and ideas. Appropriate for musicians, athletes, artists and businesspeople etc. The audiobook is easy to listen to but I had to keep stopping it to take notes. It comes with a free PDF so that will help to review the concepts covered.